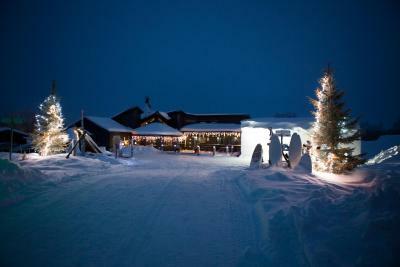 Lock in a great price for Levi Ice Hotel - Luvattumaa – rated 8 by recent guests! This year was a Harry Potter theme and the carvings were unexpected and brilliant, We had 2 layers of sleeping bag - an inner fleece lining and outer down-style sleeping bag which kept your nicely warm when snuggled down for the night. Beds were surprisingly comfy! A fab experience! 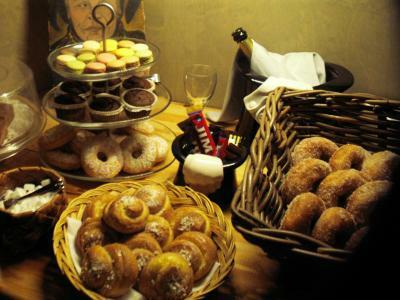 The breakfast was very good, especially the home made bread (yes, they make their own bread, which should be mentioned as a feature). The location is remote therfore you can enjoy the nature. 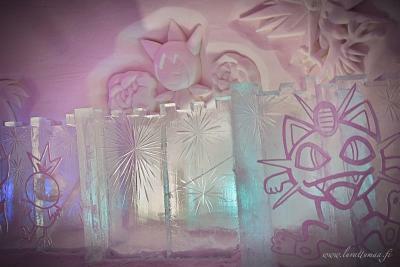 The snow castle is a piece of art and unique each year. The staff was very friendly and helpful. The sleeping bags issued were super warm, if anything too warm and we had to strip down a few layers during the night. 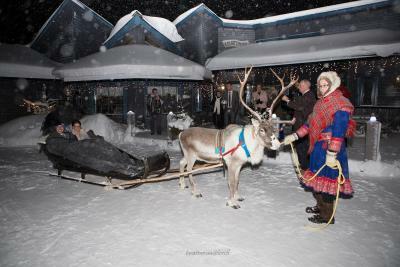 There are other things to see such as reindeer and sledges to play on, however we were not able to stay long enough to fully enjoy it due to other commitments in the morning. 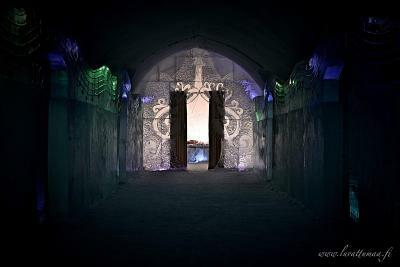 The property is unique given its made from snow and is amazing to look at the different rooms, carving and effort that has gone into this place - which they rebuild every year. 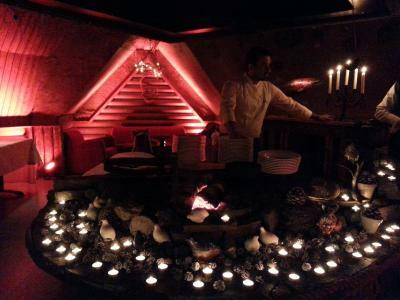 The staff were accommodating and friendly. Nothing was a problem. 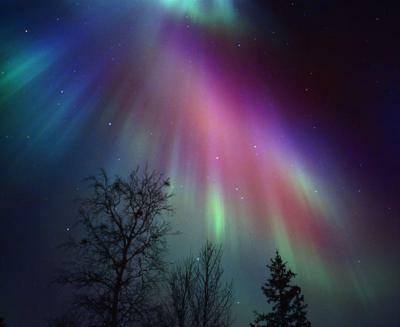 The day we stayed here was the night when we got to see the best northern lights of this season so far. 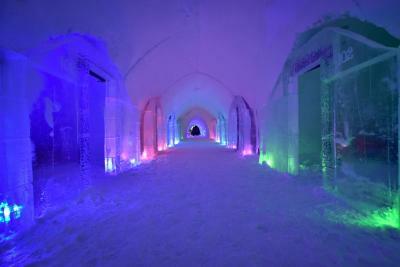 The staff is very accommodating and the snow castle is beautiful. We didn't get cold at all. Sleeping mat is keeping really warm. It was a very special experience. Super friendly host. As we were the only clients we had everything to ourselves! Nice warm comfy sleepingbag. 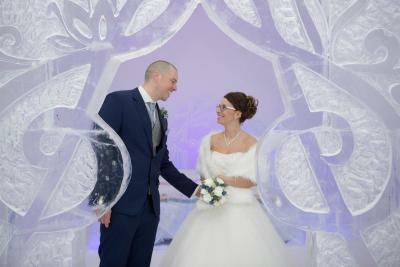 Made from over 33 ft³ of ice and snow, this ice hotel is located 4.3 mi from central Levi and 30 minutes’ drive from Kittilä Airport. 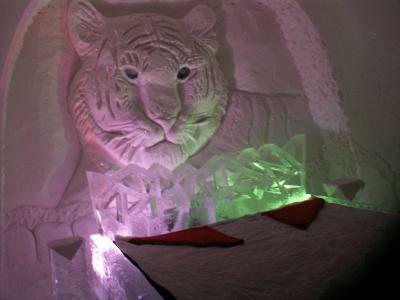 It features an ice chapel, an ice bar, a snow theater and a gallery with ice sculptures. 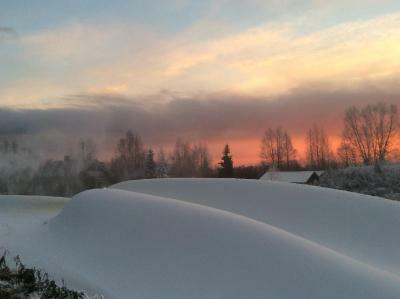 Sleeping bags, pillows and blankets are provided at Luvattumaa - Levi Ice Gallery. 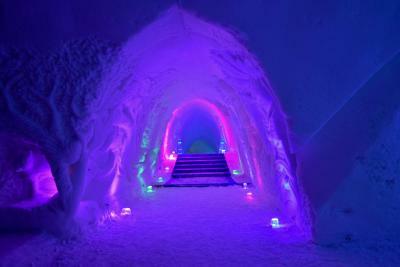 All rooms, made entirely of snow and ice, have shared bathroom facilities. 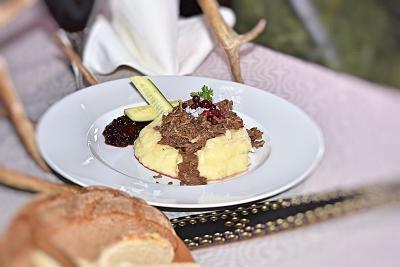 Guests can enjoy a soup in the ski café, a cold drink in the ice bar or starters in the ice restaurant. 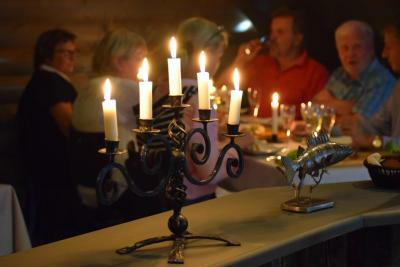 Traditional Finnish Lapland cuisine and troubadour music is offered in the Lappish hut restaurant. 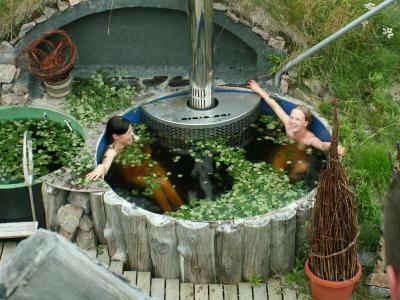 A bookable outdoor wooden hot tub and sauna are also available in Luvattumaa’s spa. 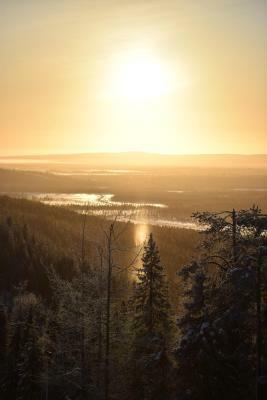 Ounasjoki River, just 30 feet away, is nice for ice fishing and cross-country skiing. 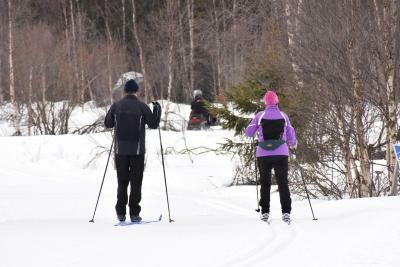 Staff helps to arrange activities, such as snowmobile safaris and dog sledding tours. 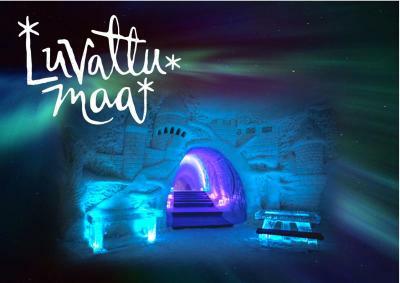 When would you like to stay at Levi Ice Hotel - Luvattumaa? 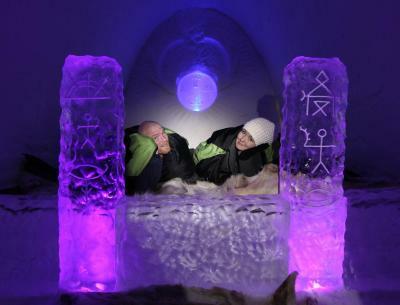 Made from ice and snow, this room includes sleeping bags and blankets. Bathroom facilities are shared. 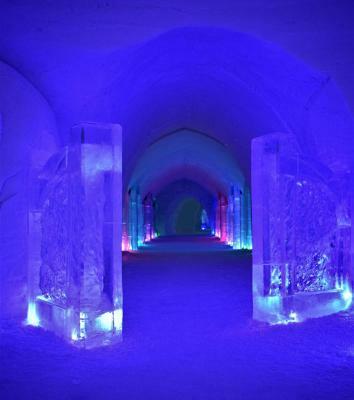 Made entirely from ice and snow, this room offers a little more space and is decorated with beautiful colors and ice sculptures. Sleeping bags and blankets are provided. Bathroom facilities are shared. 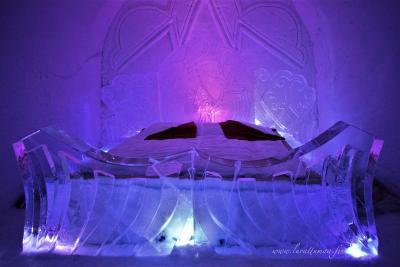 This spacious room, made entirely from ice and snow, features a heated bed and ice sculptures. Sleeping bags and blankets are provided. Bathroom facilities are shared. 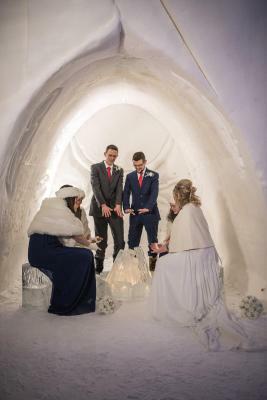 House Rules Levi Ice Hotel - Luvattumaa takes special requests – add in the next step! 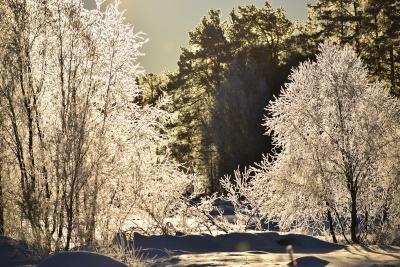 Levi Ice Hotel - Luvattumaa accepts these cards and reserves the right to temporarily hold an amount prior to arrival. Please note that check-in is only possible between 20:00-22:00. 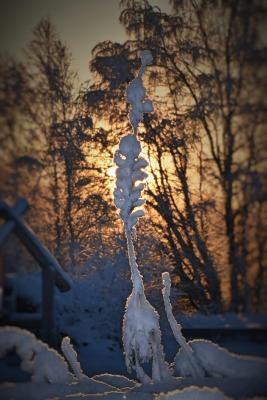 Luvattumaa - Levi Ice Gallery's reception is closed between 18:00-20:00. Please inform the property in advance if you wish to eat at the restaurant. 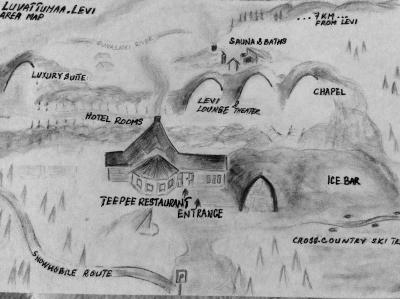 Please inform Levi Ice Hotel - Luvattumaa of your expected arrival time in advance. You can use the Special Requests box when booking, or contact the property directly using the contact details in your confirmation. Toilet and shower facilitairs are minimal. 1 shower and 2 toilets for whole hotel. The common room for guests can get a bit crowded with 3 + couples, but you can stay in the restaurant part. 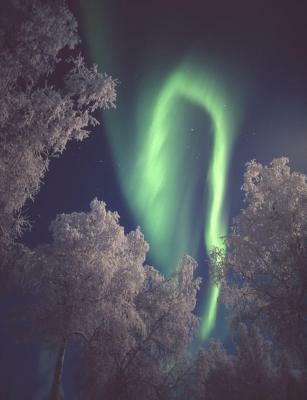 Our only regret is that we didn’t stay longer to enjoy the warm hospitality, relax in the sauna, spend another night in the igloo and explore more of the surrounding forest and lake area, or go snowmobiling. Also because we did not have a car and there was no local transport to the hotel, we had to get there by taxi which was approximately AU$35 - $40 each way, to & from Levi. However we were aware of this before we booked our accommodation here and so were prepared for it. Please do not use this issue against Choosing to stay here, or you’ll regret it. Iinstead just add it into your cost. 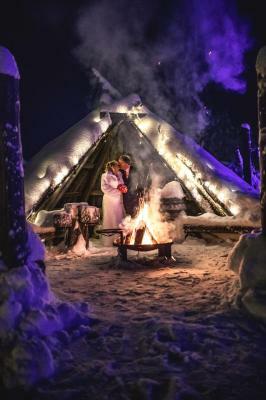 The Ice Hotel at Luvattumaa is where the magic of Harry Potter & Hogwart’s Castle comes to life in the unique ice carvings & sculptures which are embedded into the walls of this hotel. 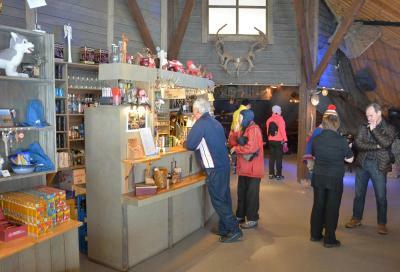 An enormous carving of Harry’s owl welcomes you into Ice Bar along with a vast array of potions in solid ice bottles, eg. Elixir of Life & Invisibility Potion. Then sit on amazing crystal clear see-through ice tables & benches & enjoy. An enormous sprawling carving of Hogwart’s Castle embedded into the wall invites you to enter its grand hallway as large carving of the Hufflepuff Emblem greets you along with ice carved books lining the staircase to the chapel & dormitory. Next are carvings of Harry’s suitcases, his owl cage, Hogwart’s Express Train & Daigon Alley. Occamy, Demiguise & shy unicorns also watch over your arrival. 3m x 2 m high Harry & Hermione carvings welcome you along the hall. Each room has its unique carving eg. Nimbus 2019, Boiling Cauldron, Golden Snitch, Mandrake, Diricawl Bird band which are silhouetted by different shades of lighting from, pink, blue, red, yellow, white & green. 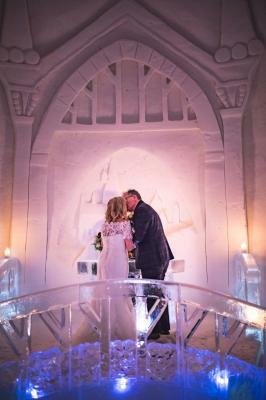 The ice chapel is real & can be used for weddings. 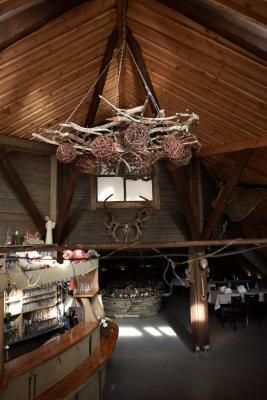 There are life sized phews on each side, solid ice carved of course & gigantic chandeliers carved high on either side of the walls. The Mirror of Erised forms the backdrop to the altar, to complete the fairytale wedding.The main hotel reception, dinning area have a unique entity all of their own. It’s as if you are stepping back in time, into a charming, rustic, warm, homely, old fashioned timber Inn, only paralleled by the warm, welcoming & sincere staff, only too eager to serve you & make your stay a memorable one. 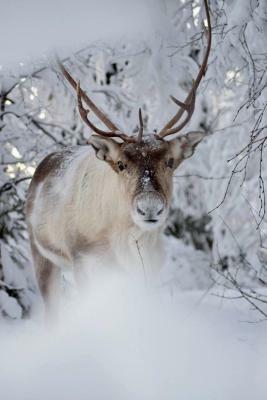 Traditional Finnish / Lapland & Sami decor adorns every corner, from acorn & reindeer antler lights, native dried flowers, native handcrafts, trolls, dolls in traditional costumes, farming tools, a scarecrow & a barn prop. Not really something we didn’t like but more some recommendations: the light stays on all night, so if you can’t sleep with lights on, bring a sleeping mask. A fleece mask for your face will also help to keep you warm. They have several available at the property but you can bring you own of course. Maybe add a welcome drink at the ice bar in the beginning...but otherwise it's cold enough. 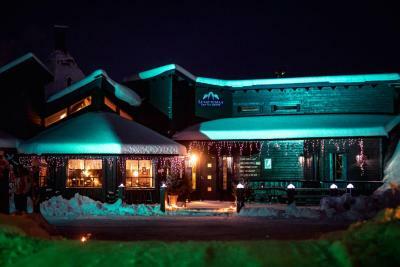 Dinner, area around, reindeer farm, snow, hotel, mostly all :)! You will love it! 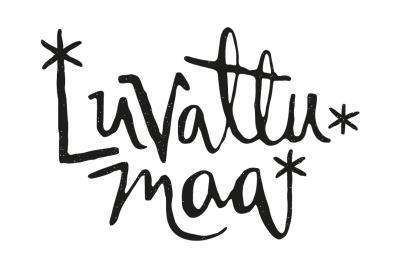 We were the only people staying at Luvatumaa so it worked well, however the shared facilities for changing, toilets etc are pretty small and would be insufficient if all bedrooms were let at the same time. Some kind of rug (Reindeer skin!) next to the beds to step onto whilst putting on shoes would be a good idea, however there was nothing but the snow/ice floor. 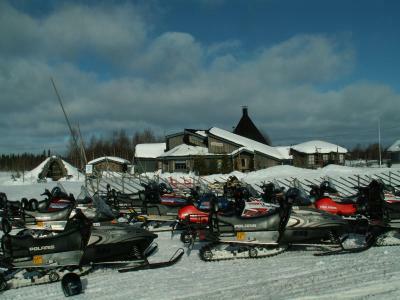 The location is a little out of town, so a 20-25 euro taxi each way from Levi. We slept in the ice hotel. The beds were too cold. I understand the temperature needs to be -6 degrees but there was not enough insulation between the ice bed and our sleeping bags. We froze. It was miserable. We eventually got up and stayed in the warm luggage room. 😂 Other guests did stay in their rooms the entire night - however all commented on how poorly they slept. 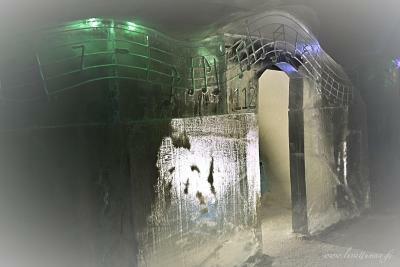 A non-ice bed in the ice room would still be a great adventure and less of a test of endurance. 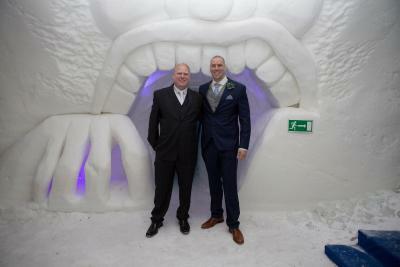 Also there is an ice bar - but no one was available to serve us a drink to have in the bar. A wasted opportunity.